A camera operator for a Hungarian nationalist television channel closely linked to the country’s far-right Jobbik party has been filmed kicking two refugee children and tripping up a man at the border hotspot of Rőszke on Tuesday. 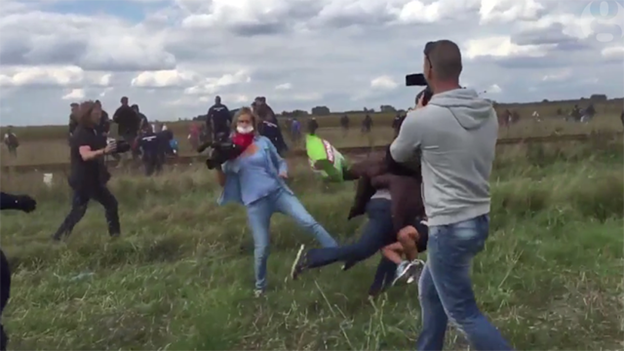 Petra László of N1TV was filming a group of refugees running away from police officers, when a man carrying a child in his arms ran in front of her. László stuck her leg out in front of the man, causing him to fall on the child he was carrying. He turned back and remonstrated with László, who continued filming. A 20-second video of the scene was posted on Twitter by Stephan Richter, a reporter for the German television channel RTL and soon went viral, leading to the creation of a Facebook group “The Petra László Wall of Shame”. Hungary’s leading news website Index had also caught László kicking a young girl and boy. Hundreds of angry comments appeared on the Facebook group set up to condemn László’s actions on Tuesday evening. Opposition parties Együtt-PM and the Democratic Coalition have said that they will initiate charges of violence against a member of the community, which is punishable by up to five years in prison, against László.